What is the meaning of specific colors in the aura? Does Kuthumi teach that the aura is an extension of the self? How does fear change our aura? Mrs. Prophet, what is the specific meaning of colors in the aura? Color is a manifestation of frequency, and frequency is a manifestation of consciousness, or one's state of consciousness. Therefore when reading the aura, you can determine the state of consciousness if you know what colors correspond to particular states of consciousness. Just as color reflects consciousness, so color amplifies consciousness. Thus, if we increase the light of purity and of the violet flame through our mantras and our prayers to God, we will also accelerate our consciousness on the white and violet rays. We have discussed the seven rays of God as the prism of the Holy Spirit and as the seven paths of Christhood that we can walk. We have also correlated these seven rays with the seven chakras. The violet light is focused in the seat-of-the-soul chakra and the white light is focused in the base-of-the-spine chakra. These chakras amplify the frequencies of consciousness that manifest as the violet light and the white light. The violet flame, or light, is the color of freedom and has the quality of mercy. It is the energy of transmutation. Violet light in the aura, then, denotes that the soul is free to commune with God. The aura always reflects whether man is maintaining the crystal-clear stream of God's consciousness released through the seven chakras or whether he is misqualifying that energy and thereby producing a muddied stream. 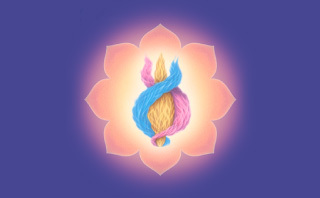 The base-of-the-spine chakra, the Mother center, gives forth the pure white light when its energies are held in the purity of Alpha and Omega—Alpha and Omega being symbolical of the divine polarity of the masculine and feminine energies that are concentrated in each chakra. Although not everyone is capable of reading the aura directly, at subconscious levels within the soul and at the level of the Christ mind we all have perceptions of one another, and we register these perceptions. There are certain characteristics that we read in one another at these levels of consciousness that can tell us much about a person before we even know him. We are usually aware when we are in the presence of someone who is holy, and often we have a warning when we are in the presence of someone who is dangerous. This indicates that although we may not have mastered the science and art of reading the aura, the God within us is aware of the God within others and the uses or misuses of that consciousness by individuals. 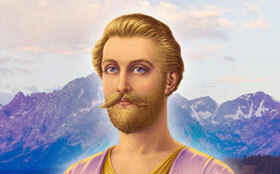 If there is a pale yellow, almost golden, light in the aura of an individual, especially around the head, we know that there is flooding through that one's mind, as Kuthumi says, the “fingers of cosmic intelligence.” This energy present within the aura enables the mind of man to contact the universal Mind of God. We can make this contact through meditation upon the Buddha or the Christ, both of whom have given us the key to unlocking the crown chakra, which is the yellow center. Then there is the pink fire of divine love that comes forth through the heart chakra. When it is not misqualified by the human sense of possessiveness, attachment or inordinate desire, it produces within the aura a billowing cloud of pink energy, denoting that the individual is infused with an awareness of God as love. 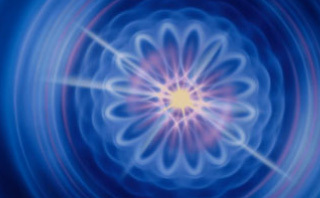 If there is a purple fire flecked with gold and ruby in the aura, we know it comes forth from the solar-plexus chakra. This tingeing of the purple flame with the gold denotes the mastery of the light of peace within the solar plexus and is an indication that the individual is active in service to life. The green, or emerald, fire comes forth from the third-eye chakra and indicates a manifestation of truth and abundance. Those who have green in the aura are devoted to science and to the practical application of that science. When one's pursuit of science becomes tainted by a materialism and ignorance of God's laws, then the green of the aura no longer reflects the pure emerald hue of the stone by that name, but it becomes muddied—an olive drab, even a brownish green. Those who have pure emerald green within the aura are healers, and through them and through their chakras flow the healing currents of the Elohim and of the cosmos. 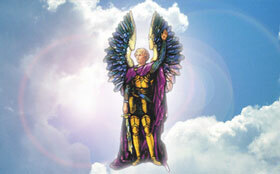 The electric blue color that flashes in the aura of Archangel Michael and the devotees of the will of God denotes the presence of purity and power and the alignment of the inner blueprint with the cosmic blueprint of the will of God. It also denotes mastery of the throat chakra in the spoken Word. Reading the aura will always tell us where there is mastery or attainment in the use of the chakras and where there is a perversion or a willful misuse of the chakras. Mrs. Prophet, does Kuthumi teach that the aura is an extension of the self? Yes, but he also teaches that the tone of the divine aura is an extension of God, just as the mode of thinking and feeling is the extension of the human consciousness. He explains that the interference with the aura in its natural, pure state by the mortal consciousness and by the misqualification of light creates negative colorations. The muddying of the pure colors of the aura occurs whenever there is a mingling of the emanations of imperfect thoughts and feelings with the pure colors released through the prism of the Christ. This marked change in color and vibration is obvious to the trained eye. For instance, the aura of someone who is in a state of contemplation, study or meditation might have the presence of a yellow light, a violet light and even a blue light—the blue indicating faith in God. In a sudden emergency, such as a fire or a calamity within the household, the quietness of the aura would be disturbed. There could be a burst of fear from the solar plexus, accompanied by feelings of butterflies and extreme tension. Such stress would produce a muddying of the violet light of the aura as well as explosions, perhaps, of great energies of fear recorded as brown, black and gray substance. Depending on the calamity, there could also be grief, resulting in a further darkening of the aura. Or people might begin shouting at one another, causing jagged lines of force to come forth from the throat chakra. So you can see that the aura can change instantaneously. The aura changes moment by moment. You can master the flow of energy in your aura by maintaining a calm state of equilibrium in the midst of whatever happens within your environment, all the while maintaining contact with your source, the I AM Presence. You have the capacity to draw enormous quantities of energy from your I AM Presence to stabilize conditions that might, for instance, be burdening others within your household. When you are conscious of your energy field and you zealously guard it as the habitation of God, then you are able to retain your reservoir of light and not constantly be like a cork bobbing upon the sea. You will not be milked of your light and your energy. You will not spill the cup as soon as it is filled and fail to make any permanent progress on the path of discipleship. Always remember…that those who fall in the swamp may come up covered with mud; for the quicksands of life, by their very nature, always seek to drag man down. But man can and does escape these conditions, overcoming through the same glorious victory that brings forth the lotus in the swamplands of life.I want you to understand, then, that by a simple act of invoking the light of the Christ consciousness, man can overcome the ugly chartreuse green of jealousy and resentment, the muddied yellow of selfish intellectualism, the crimson reds of passion, and even the almost violet-black attempts of self-righteous justification. To see others clearly, beloved hearts, remember that man must first perceive in himself the beautiful crystal of cosmic purity. Then, casting the beam out of his own eye, he can see clearly to take the mote out of his brother's eye.By the purification of your perceptions, you will be able to enjoy the entire process of beholding the Christ in self and others, as one by one the little disturbances of the aura are cleared up through the natural manifestation of the childlike beauty of cosmic innocence.